It's deja-vu all over again as Interplay warns that it is standing on the precipice of financial apocalypse and that the future of Fallout Online may be at risk. There was a time, believe it or not, when Interplay was one of the most respected and, yes, even beloved videogame publishers in the business. The Bard's Tale games, Neuromancer, Battlechess and Another World are just a few of the many great games Interplay put out in the 80s and 90s. And let's not forget that whole Baldur's Gate/Icewind Dale/Planescape: Torment thing, eh? Wow! But circumstances have been unkind to the company in recent years, as the new millennium saw it take a header into a fiscal pit from which it's never been able to climb out. Yet strangely enough, while the Reaper's scythe has hung over the company's head for the better part of a decade, it's never actually fallen. In 2007 Interplay even began to mount a comeback, financed primarily by the sale of the Fallout IP to Bethesda, with hopes for the future pinned largely on the success of a licensed Fallout MMO. Things began to look up; Bethesda's success with Fallout 3 stoked interest in the franchise, which Interplay capitalized on, to a point, with "Project V13" concept art, some catchy emails and even a teaser site at fallout-on-line.com. But then, as usual, the wheels came off. In 2009, Bethesda demanded that Interplay return the rights to the Fallout MMO, a dispute still working its way through the courts, and then in December 2010 the company revealed in its quarterly 10-Q SEC filing that it had yakked up $205,000 for the quarter and that the future looked mighty bleak if it couldn't come up with a new source of funding el pronto. Here we are, five months later, and Interplay's situation is, if anything, worse than ever. Its 10-K filing for 2010 reveals that the company is essentially broke, with about $3000 in cash and a "working capital deficit" of over $2.8 million. "If we do not receive sufficient financing or sufficient funds from our operations we may (i) liquidate assets, (ii) seek or be forced into bankruptcy and/or (iii) continue operations, but incur material harm to our business, operations or financial condition," the filing says. "These measures could have a material adverse effect on our ability to continue as a going concern." The filing also revealed that Interplay is currently operating without a chief financial officer, a situation "which affect our ability to mange our financial operations," and that "the unpredictability of future results may cause our stock prices to remain depressed or to decline further." "Our business and industry is both seasonal and cyclical. If we fail to deliver our products at the right times, our sales will suffer," it continues. "Our business is highly seasonal, with the highest levels of consumer demand occurring in the fourth quarter. Our industry is also cyclical. The timing of hardware platform introduction is often tied to the year-end season and is not within our control. As new platforms are being introduced into our industry, consumers often choose to defer game software purchases until such new platforms are available, which would cause sales of our products on current platforms to decline." All of which is unfortunate for the once-mighty Interplay but not necessarily of any great interest to gamers. What is of interest, however, is summed up in one short, succinct sentence near the top of page 5. "We may not be able to successfully develop a Fallout MMOG," it says. "We plan to exploit the license that we hold to create a Fallout MMOG. We must satisfy various conditions to maintain our license. Although we believe that all such conditions have been met, our licensor Bethesda Softworks LLC filed a legal action attempting to terminate our license," the filing says. "If we lose the pending litigation, our license to create a Fallout-branded MMOG may be terminated and we might not be able to successfully launch the game." It's pretty clear that the ongoing courtroom battle with Bethesda is hardly the only thing standing in the way of Interplay's Fallout Online, or even the biggest thing. The company has no credit agreement or credit facility and admits that it will probably take a beating on any new deal it does manage to put together; it may be forced to raise money through equity offerings or debt financing, which will probably result in a "substantial dilution" of value for current shareholders; it may be forced to seek bankruptcy protection. The list goes on. When Interplay's bad-news 10-Q filing came to light last year, I said that I'd given up betting against the company's preternatural survivability years ago. 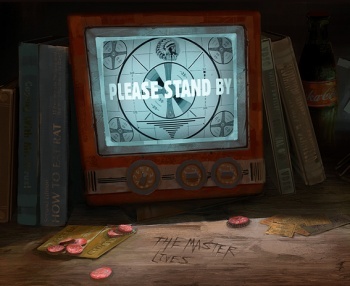 Now, perhaps somewhat perversely, I'm actively rooting for it to keep kicking, or at least grotesquely twitching, not just because I want to see an Interplay-developed Fallout MMO but because I find its slow-motion existential breakdance routine to be absolutely fascinating to watch. Interplay is like the anti-Duke Nukem: it's here, it's always been here and nobody seems able to figure out how to make it go away. Interplay's full and somewhat depressing Form 10-K filing with the U.S. Securities and Exchange Commission can be read in full at sec.gov.